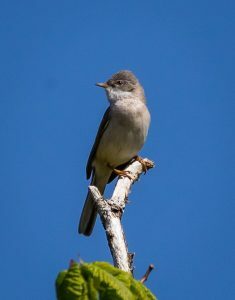 ISLAY: A Lesser Whitethroat was reported from Rockside (Bob Davison). MID-ARGYLL: Anne-Lise Dickie reported an Osprey fishing at Loch nan Druimean, Kilmelford and 2 male Hen Harriers over over her garden at Scammadale was a garden tick. 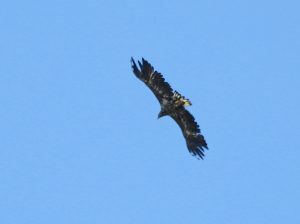 An imm White-tailed Eagle soared over my house in Cairnbaan this afternoon (Jim Dickson). MULL: 2 Tree Sparrows at Treshish House yesterday (Anand prasad per Alan Spellman). NORTH ARGYLL: Robin Harvey noted 2 small Moorhen chicks now at Benderloch gravel pits. WHITE-TAILED EAGLE – Cairnbaan, Mid-Argyll 16th May (Jim Dickson). COMMON WHITETHROAT – Duntrune, Mid-Argyll 16th May (James Lehmann).